So the good news is I have been unexpectedly graced with a plethora of photo (and video!?) gigs since the beginning of January, and the one unfortunate effect of such livelihood awesomeness is that I’ve not had as many chances to work at Brake Manor as hoped, and the lack of progress is starting to make me nervous. Alrighty, so since I’ve been such a slacker at documenting our progress, I’ll start where I left off and in the next few days I’ll work on writing up each task we’ve accomplished so far. The kitchen floor cement sanding is fiiiinally finished and it looks great. We’re really excited to slap some sealant on it and see it all glossed up and sassy. There are a lot of larger pebbles in some areas of the cement which gives it a neat pattern now that it’s been sanded down. Next, we brought in a master electrician friend in mid January and at every turn he’d shake his head and slowly say “oh gawd” as he inspected the electrical system, so we knew we had to tackle the worst of that before anything else. 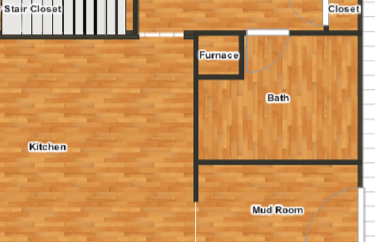 It took me about 4 hours to go through the house and identify all circuits since none of them were labeled beyond generic terms such as “front of the house” and “half of the kitchen”. To start, I arbitrarily renumbered the breakers just to have a clean starting point. Then I used a little light-up outlet tester and made passes through the house checking each unknown outlet with one breaker turned off at a time, marking them off on my room map as I went. On those rogue outlets that didn’t seem to match any of the breakers, I plugged in my boombox and blared it loud enough that I could sit in the attic and flip each switch until I found the one that killed the noise. My little map I made for documenting our work. 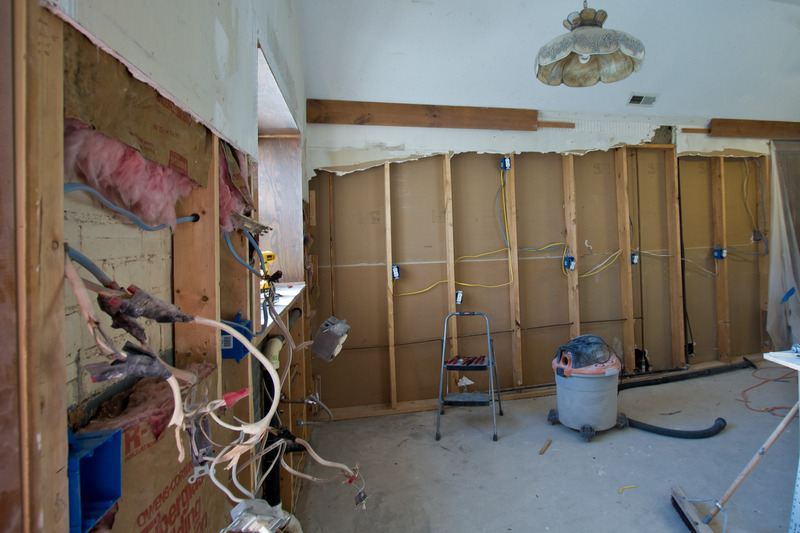 Once we knew which breakers controlled what, the next project was to open up two of the four kitchen walls and pull out all the electrical. The plan was to reinstall it correctly while moving existing outlets to standard heights and locations, and we decided to add a few more while we were at it. It was a royal mess in those walls. Random uses of 14-12 gauge wires; no grounding on the garbage disposal; splice after ghetto splice; nothing stapled down; each outlet was at a different height and one was even embedded into the window trim for some reason… it was so much fun learning the do’s and don’ts of electrical as we pulled the old work from the walls. Left wall: old electrical. Right wall: new electrical. Much better! As soon as the old kitchen wiring was removed on the South wall Dad gave me a how-to lesson on the first two outlets and then we split up and tackled the rest of the kitchen. Learning life lessons from my dad makes me realize just how lucky I am to have him around and it also makes me feel a little sad that he never had a son he could teach these things to since he’s such a DIYer (unfortunately his only son, Seth, has Down Syndrome). I figure a handy-girl daughter who is eager for any wisdom he’s willing to impart unto her has still got to be better than nothing though. 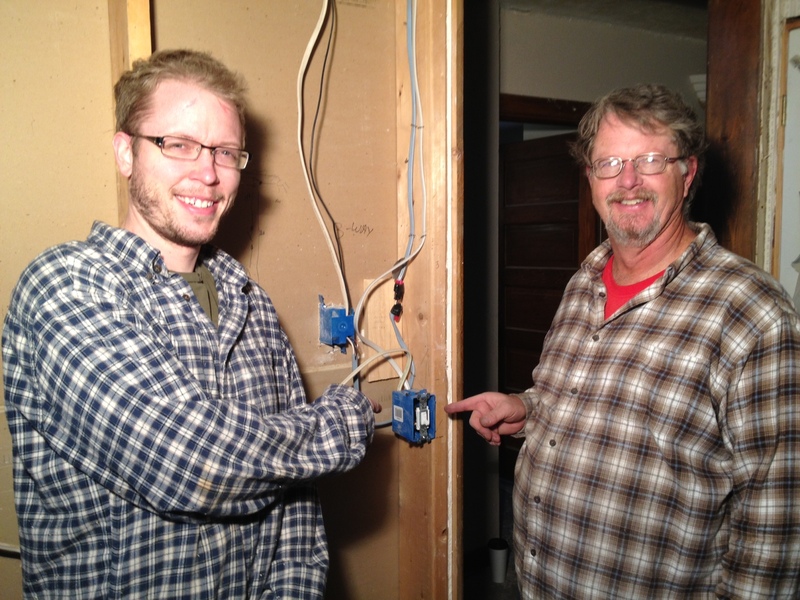 Dad and Jason added a 3-way circuit to one of the two kitchen lights since there was no switch by the hallway entry. 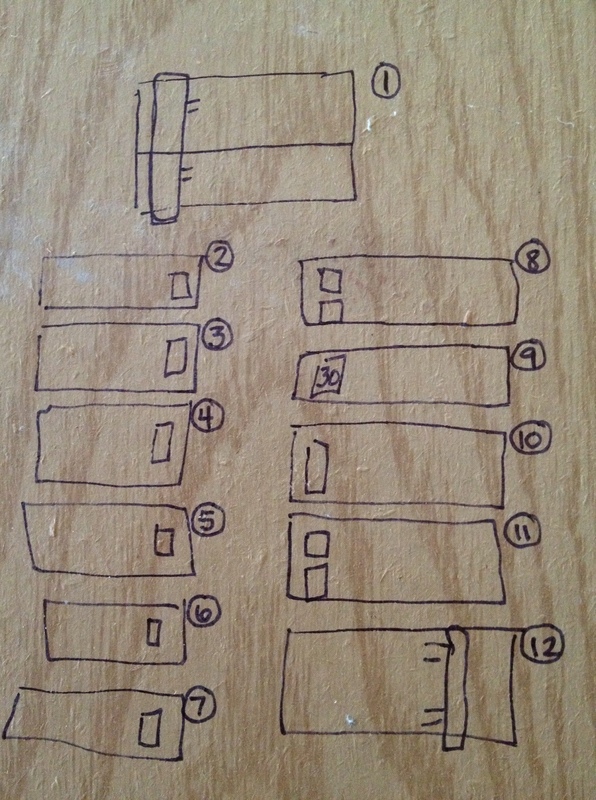 It took me a while to wrap my brain around the logistics of how to wire up a 3-way but Dad made schematic sketches on the back of some drywall for me and it finally clicked. I can’t help but be amused at what someone will find in our walls down the road on the next remodel adventure; shopping-list notes, circuit drawings, and several mushy J+A=Forever‘s drawn on the backs of the drywall. 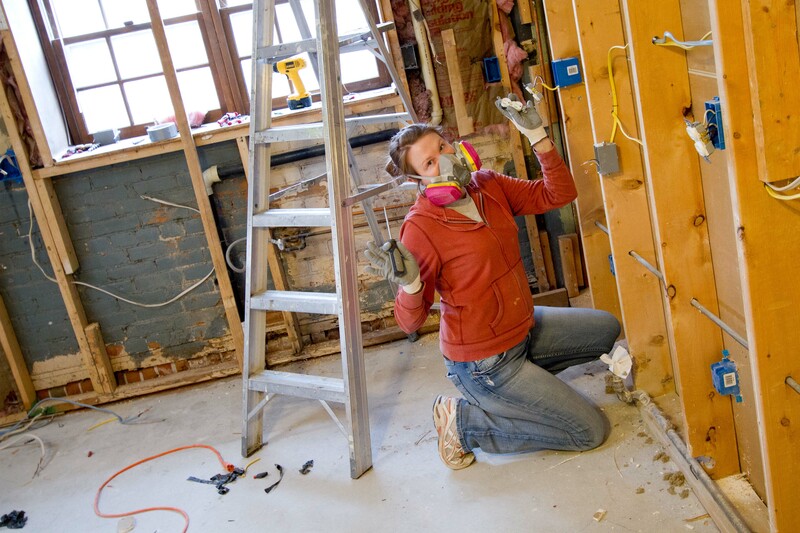 Just me, workin’ on some electrical. When we removed the wallpaper in the kitchen we had found phone numbers and ToDo notes on the drywall by where the phone jack was which made me remember how much history this cool little cottage of ours has already seen just since it’s last makeover. We also found pennies, 22-bullets, seeds, toys and newspaper clippings in the walls from whomever did the last renovation so we’re going to be sure to at least add some coins from 2013 in all the walls we’ve worked on too.